Orangetheory is a workout that very explicitly fuses fitness and science to create an amazing exercise experience. When I first heard about Orangetheory, it was as if my prayers had been answered. I really love the idea of monitoring my heart rate, but it’s something that I think requires a little guidance from a professional in order to use the information that you’re fed to its full potential. I’m so glad that I’ve found a fitness concept and dedicated studios to do the hard work for me. Orangetheory® was developed in the US by Ellen Latham and is a high-energy, interval training based group training class. What’s particularly unique about it, besides the super sleek, state-of-the-art studio and equipment, is that it is a heart rate monitored session. During the workout, you wear a chest strap with a heart rate monitor. Your heart rate, along with everyone else’s in the class, is displayed on screens in the studio, which tell you your heart rate, % of max heart rate, and colour indicates which heart rate zone you are working in. You can also see an estimate of calories burned. Getting such immediate, visual, data-driven feedback on your workout is incredibly motivating. The session aims to take your heart rate to a target zone - the Orange Zone - to stimulate metabolism. Each workout is divided into intervals of cardiovascular and strength training. The workout that I did alternated between time on a treadmill (one of the few treadmill sessions in my entire life that I have enjoyed) and resistance training using a mixture of freeweights, TRX and bodyweight. There was also an option to use the rowing machines (added incentive: David Lloyd clubs use the WaterRowers, which are a dream!). All classes on a given day will be the same workout. However, they change from day to day in terms of what equipment is used, what exercises are performed, and what the split between cardio and resistance is. The studio doesn’t advertise what focus any of the classes are scheduled to take. This prevents people from only booking on to classes that they favourite and training in ways that they are probably already pretty used to (something that I would most likely be entirely guilty of). Instead, the Orangetheory trainers want people to benefit from all-round fitness training. My only tiny criticism is that without undergoing lab testing, calculations of your max heart rate, and therefore heart rate zones, can’t be 100% accurate. Here, they are based on a standard formula. But, taking all of the awesomeness of this workout into account, it’s damn close enough! The concept of a heart-rate monitored group workout is brilliant. I love getting immediate, genuinely useful feedback based on actual data. It’s a great motivator during class, and enables the trainer to respond to you more personally, too. During class, there are lots of names on the board, but it doesn’t matter. Your heart rate zones won’t be the same as anyone else’s, so the only person that you’re competing against is yourself. It’s so easy to become completely immersed in the experience of the class. It’s great that the workout design is based around the physiological theory of EPOC. It makes the sessions a brilliant choice if you’re looking to lose weight. I’m not looking to lose weight, so the instructor estimating how many calories I was going to burn post-workout was slightly terrifying (I struggle to eat enough calories anyway!). However, knowing that this was due to pushing myself into higher heart rate zones was thrilling. My goals are to really improve my aerobic and anaerobic fitness, and this workout gives me a very visible and stimulating structure with which to do that. I also like that I was emailed a report following the session, so that I can also compare data across classes and aim for improvements. I wish that I had a studio closer to where I live or work so that I could go more often! I attended a class at David Lloyd’s Islington Orangetheory studio. There are also studios in Aldgate, Enfield and Winchester. What're your thoughts on Orangetheory? For those of you that don’t know, I have just moved to London (after going between Cambridge and London and pretty much living out of a suitcase for a few months). I’m so excited to finally be here permanently, and even more excited to use ClassPass to discover my local fitness hotspots. ClassPass is a monthly fitness membership that allows you to experience a diverse range of workouts across a network of beautiful, boutique partner studios in participating cities. ClassPass only launched in London in March, but knowing that they already successfully operate in a multitude of U.S. cities, I was absolutely thrilled to jump on board right away to start exploring . There are thousands of classes available to ClassPass members, including cycling, pilates, yoga, strength training, dance, martial arts, and more. There are outdoor classes, indoor classes, and they are spread all over the city. I’ve noticed that there’s a large number of yoga and pilates studios and classes, especially, from well-known studios such as TriYoga and TenPilates, to smaller centres with more of a community feel. There are also some cult studios such a FRAME, 1Rebel and BOOM Cycle that have joined the diverse ClassPass network. Honestly, there is so much variety and such an incredible quantity of classes available every single day that I usually don’t even know where to start when I log in to book onto some sessions! I really like the feature on the site that allows you to ‘favourite’ particular studios. I have marked the ones that are closest to me and that I’m particularly keen to try out. New studios and classes are also being added on a frequent basis so I’m constantly keeping my eyes peeled for exciting email alerts. As a ClassPass member, you have the freedom to take as many classes as you want per month. However, each studio in the ClassPass network can be visited a maximum of 3 times per month under the ClassPass membership. I think this is a brilliant idea, so that you can get a feel for a studio by taking alternative classes or you can return to your favourites, but you are also compelled to keep variety and excitement in your workout schedule, which is what ClassPass is all about! It’s so easy to book, even when you’re on the go. The ClassPass website is really well optimised for mobile although I’d love to see an app launched in the near future. Edit: My wish has been granted; the ClassPass iOS app has landed in London. Checking in at classes is super easy, too. There are no print outs or vouchers to show, but it’s a good idea to take a photo ID. If need be, you can cancel your ClassPass membership at any time, or even put it on hold for a month. ClassPass membership is available for just £89 a month - that’s generally cheaper than a membership to a single boutique studio. Even better, if and when you’re ready to commit, you can sign-up for 3 months for £69 a month or 6 months for £59 a month! The link below is your invitation to join ClassPass, go ahead and check it out! If you haven’t yet started your membership, what studios and classes would you be keen to try?If you’re already in the ClassPass club, what are your favourites? I’ll be doing my best to keep you updated on the best classes that I visit during my membership! Les Mills Immersive Fitness™ has Launched! 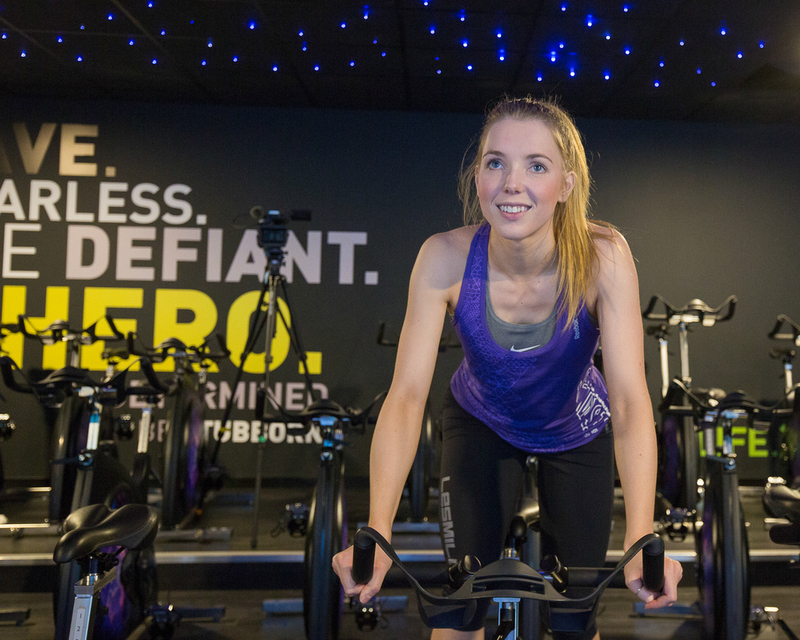 Les Mills IMMERSIVE FITNESS™ has just launched in the UK, and as a huge fan of Les Mills workout programmes, I was really excited to be one of the first to try it. I headed to the UK’s first IMMERSIVE studio at David Lloyd Rayne's Park for a completely mind-blowing workout. IMMERSIVE FITNESS™ is a workout concept developed by Les Mills. If you haven’t heard of Les Mills, why not?! They are the creators of globally-successful group fitness classes such as BODYPUMP™, BODYCOMBAT™ and RPM™ (a studio cycling workout). Well, RPM™ has now been taken up a notch. THE TRIP™ is the name of the 30 minute class that I experienced, fusing RPM™ with the IMMERSIVE concept to complete a truly unique exercise experience. During the class, the lights are lowered and rich visuals on a screen taking up the entire wall of a purpose built studio transport you through galaxies, space-age cities and across oceans. The virtual reality changes with each workout track, ensuring a variety of hills, flats, mountain peaks, time trials, and interval training. Throughout the whole class, the instructor’s cues are not only synchronised with the music, but the on-screen graphics, which is really motivating and helps to completely immerse you in the ride. My IMMERSIVE experience was completely sensational. I didn’t think once about the length of the workout, I just kept pushing myself harder and harder and loved every minute of it. While riding through the space-age city, it felt like I was in a TRON video-game and while climbing up steep glaciers it was like being in a movie. My favourite part of the workout was when, while sprinting laps around the digital velodrome, we were leaning forward into descents and pushing sideways around corners. The combination of these perfectly cued movements with the incredible cinematics, made it feel like I was in a theme park simulator. I even felt my stomach lurch a couple of times; in a good way, of course! This workout would be fun for absolutely anyone (so long as you’re willing to suspend your disbelief a little) and would also be a great way to introduce children and teenagers to workouts that would otherwise seem daunting. Have you manage to squeeze yourself into an IMMERSIVE FITNESS™ class at David Lloyd yet? Let me know what you think to the concept! Recently, I’ve introduced a scientifically-backed exercise protocol to my training sessions: Tabata. Since I had my first sweaty experience of Tabata with Master Trainer Richard Scrivener, I’ve been hooked. Tabata is a form of High Intensity Interval Training (HIIT), which is something that I have been a fan of for a long time. However, Tabata follows a unique structure; 20 seconds of exercise at maximum intensity, followed by 10 seconds rest, repeated 8 times. That makes this super-effective drill’s duration just 4 minutes. That’s doable for anyone, right? Group 1 followed the Tabata protocol, working at 170% of their VO2 max during the 20 second exercise blocks. Group 2 worked at a VO2 max of 200% for 30 seconds, but had longer rest periods of 2 minutes, and repeated this for 4-5 rounds. The Tabata method increased both anaerobic and aerobic fitness. How is it possible to work out above 100% of your VO2 max? Your VO2 max (100%) is the maximum amount of oxygen that your body can use during exercise. Working at your VO2 max and below means that you are in the aerobic zone, meaning ‘with oxygen’, and can likely sustain the exercise for a long period of time. Exercising above your VO2 max means that you are in the anaerobic zone, ‘without oxygen’, which can only be sustained for a very short period of time. Essentially, there’s an inverse relationship between how intensely you can exercise, and how long that exercise can be sustained for. So, if you feel that you could do longer intervals, you aren’t pushing yourself hard enough. If you decide to try the Tabata method, be sure that you putting everything you have into each of the 20 second bursts. Go all out! A full Tabata class, like the one that I took with Richard, lasts for 20 minutes. This incorporates a warm up, a few minutes of cardio to start increasing heart rate, a break down of the exercises that will be included in the Tabata, the official 4 minute Tabata workout, some core conditioning, and a cool down. A number of different exercises can be used to form a Tabata from body weight exercises, to treadmill sprints. I also really like to use a spin bike or rowing machine to ensure I get lots of variety in my Tabatas. When you’re selecting exercises to include in a Tabata, be sure to choose explosive movements that will challenge you. Some of my favourites include burpees, mountain climbers and squat jumps. I’m sold. If I can improve both my aerobic and anaerobic fitness by adding just 4 minutes of HIIT per session, I’m damn well going to do it! I love that I can easily add a blast of cardio onto the end of a weight training session to ensure that I’ve covered all bases during my workout. Be warned: it’s brutal. You will sweat, you will be out of breath, and your muscles will fatigue. Don’t expect to end your workout with a Tabata and then be off the gym-floor and in the shower a minute later. I spend more time recovering from a Tabata than I do completing it, but I push myself hard because I want the best results. I recommend downloading a Tabata timer app and giving it a go! Have you tried Tabata? Let me know what your favourite exercises to incorporate are!